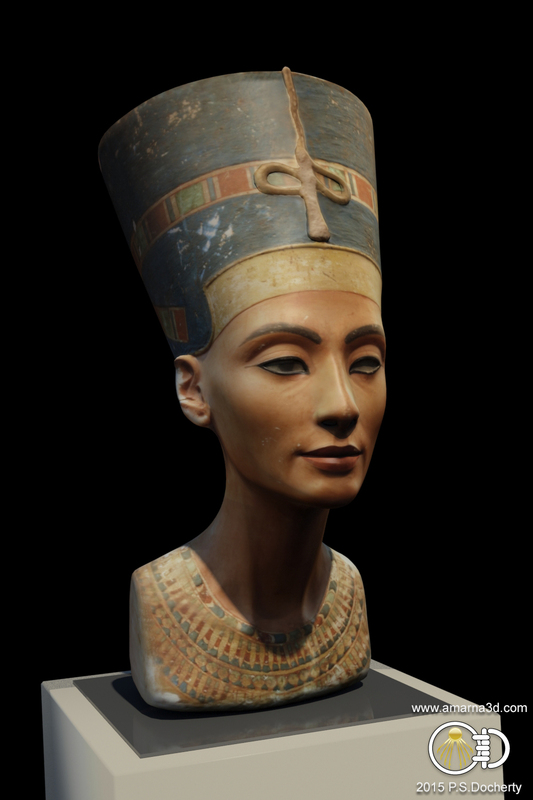 My 3d reconstruction of the Bust of Queen Nefertiti viewed from the same angle as the wikimedia photograph for comparison. 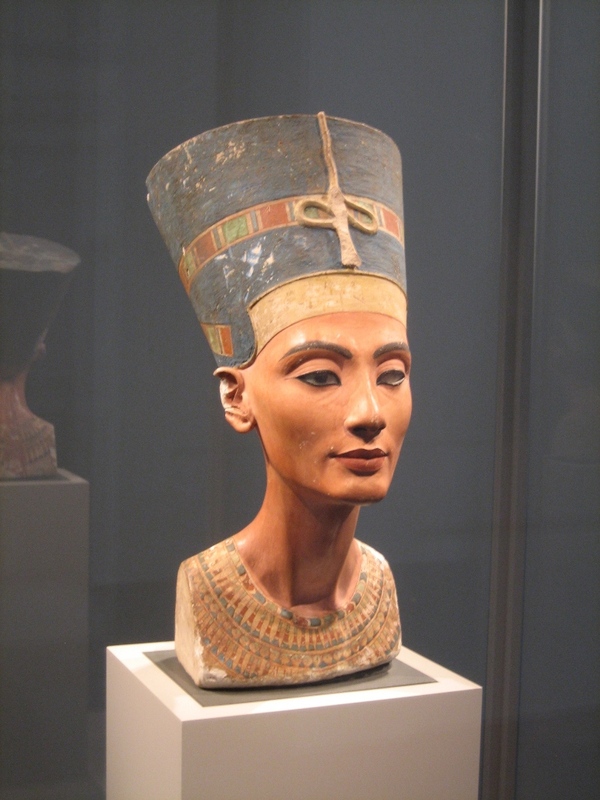 Photograph of the Bust of Queen Nefertiti which can be found on display in room 2.10 of the Egyptian Museum, Berlin. 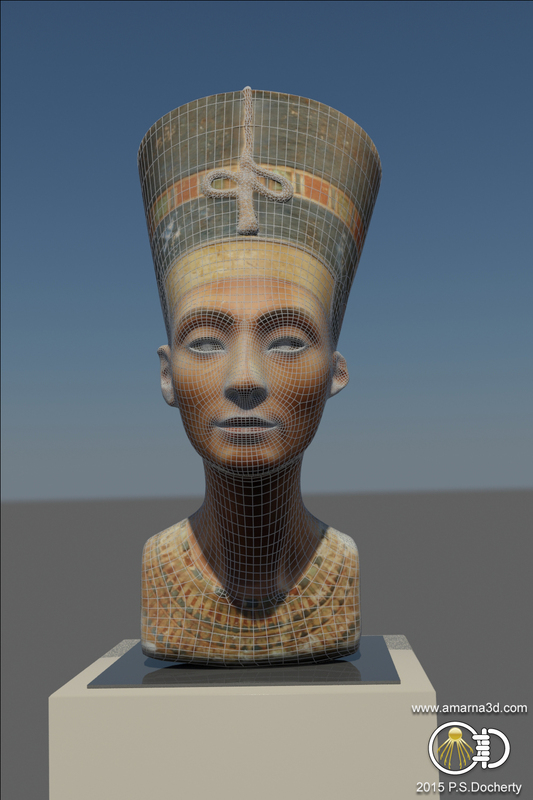 I had some research time this week so I decided to have a look at the various Amarna sculptures as a prelude to modelling some for the city. My hope is that I can model the remains and then look at restoring them to their former glory and site them in their corresponding locations. My first model has been the bust of Nefertiti, mainly as a test piece. I wanted to recreate it as real as possible and used a number of methods to achieve this. I have seen many recreations on-line and none of them seem to do it justice so I decided to gather as many source images as possible in order to get all the angles covered. 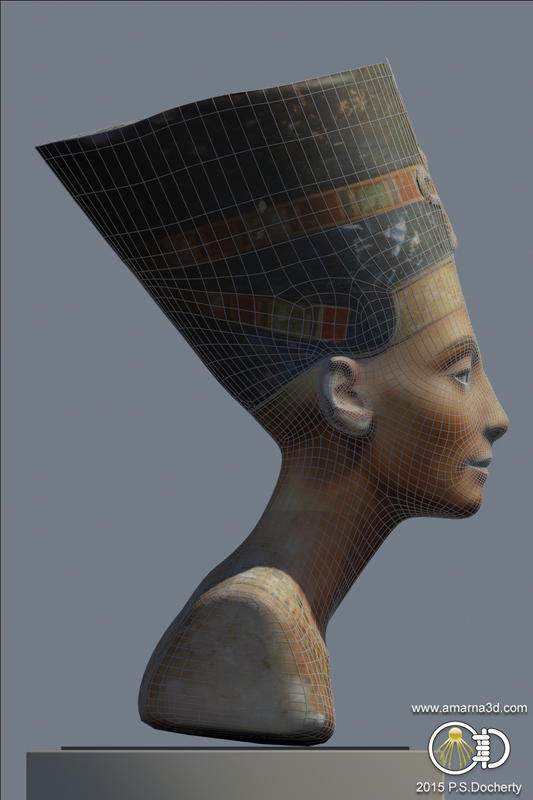 Some of the images of Nefertiti’s bust used in the 3d reconstruction. 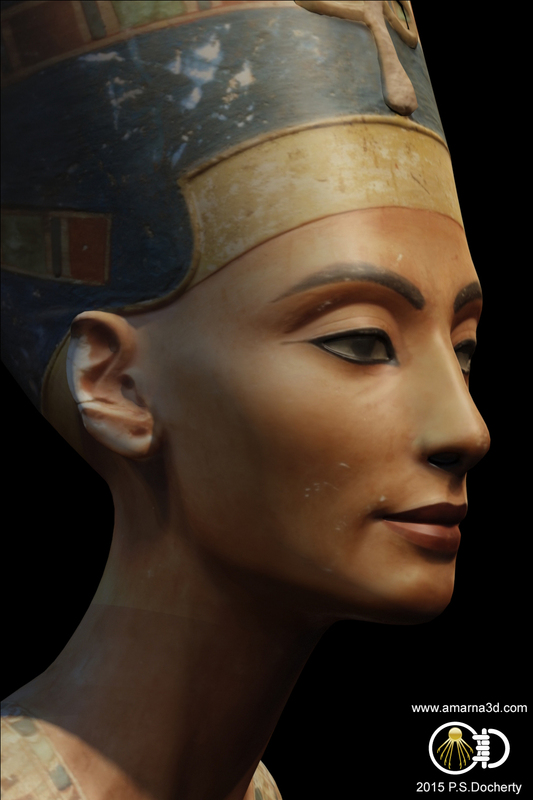 There are a lot of images which can be expected when the bust is one of the most copied of all Ancient Egyptian artefacts. Sifting through them showed that some were flipped images and some were very good museum copies. I used a combination of techniques to speed up the process and the results can be seen below. When I get more time I will likely update this post with a better breakdown of the various modelling stages. 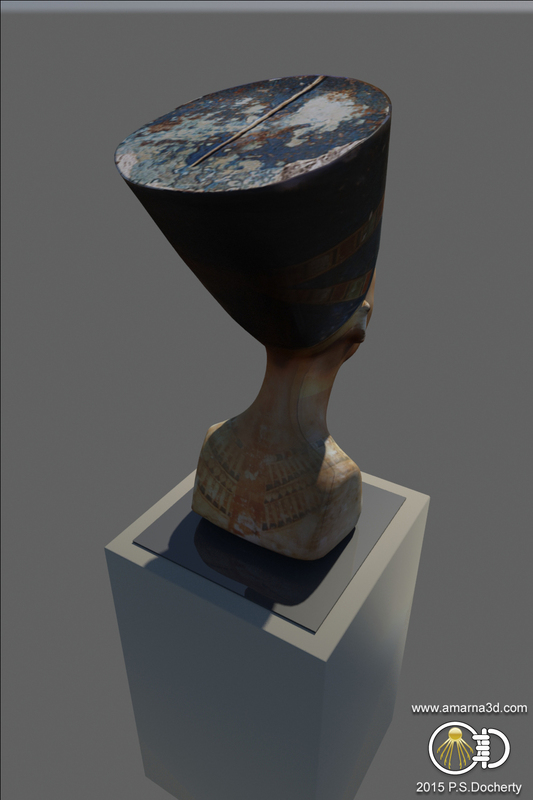 The next model will be one of the Ahkenaten statues which if all goes well will be ready in a week or so. There are still some tweaks which need to be done particularly the base of the nose as this needs to have some sharper edges. 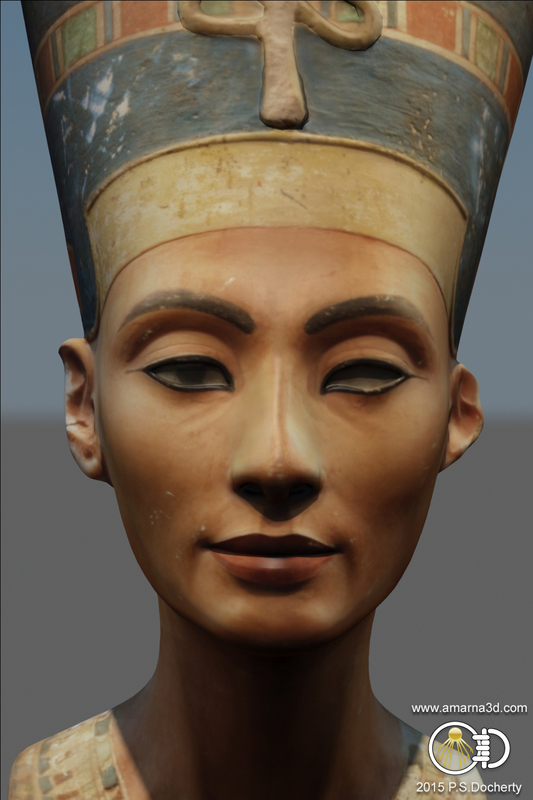 In general though this was a good reconstruction which pretty closely matches the original in form. A few tweaks still need to be made before I would say it is complete. The underside of the nose needs sharpening as already mentioned. The ears need to have their backs modelled more accurately. The top texture is quite low resolution and needs to have better resource photographs to work from. This will need to wait until I can source some. The back texture of the shoulder area on the right side needs more work, again I need better images. 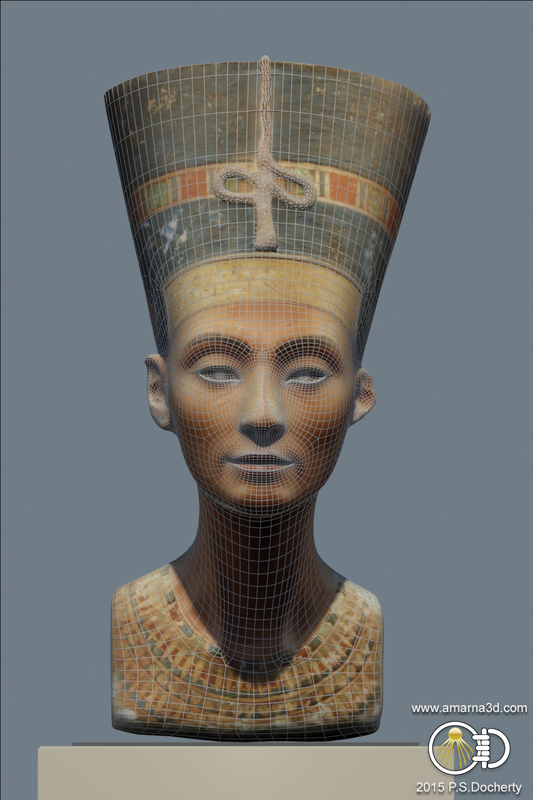 Bust of Nefertiti from the rear showing a number of fixes which still need to be made.